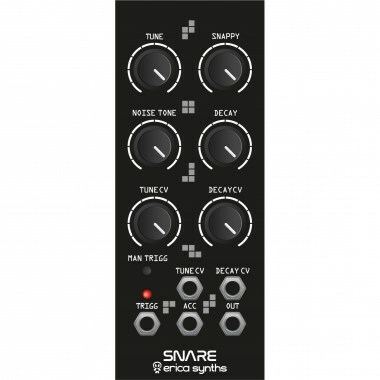 Erica Synths Snare Drum is developed in collaboration with the French company e-licktronick and it's our take on analogue snare drum circuits adapted for modular systems. Sharp, punchy sounds, Accent & CV control over key parameters of the module make it distinctively expressive in studio and live performances. 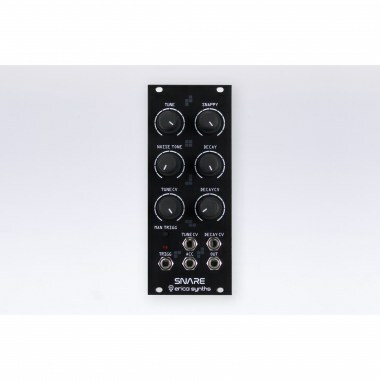 Eurorack модули Erica Synths Snare Drum Вы можете купить по выгодной цене в наших музыкальных магазинах в Москве и Санкт-Петербурге, интернет-магазин, доставка по России. On this run of modules the Pitch & Decay CV inputs are inverted: rising CV will decrease pitch, falling - increase.